Almost half of Virginians think their Governor, Ralph Northam, should step down for having a picture in blackface on his medical school yearbook page. The same number think he should not step down. 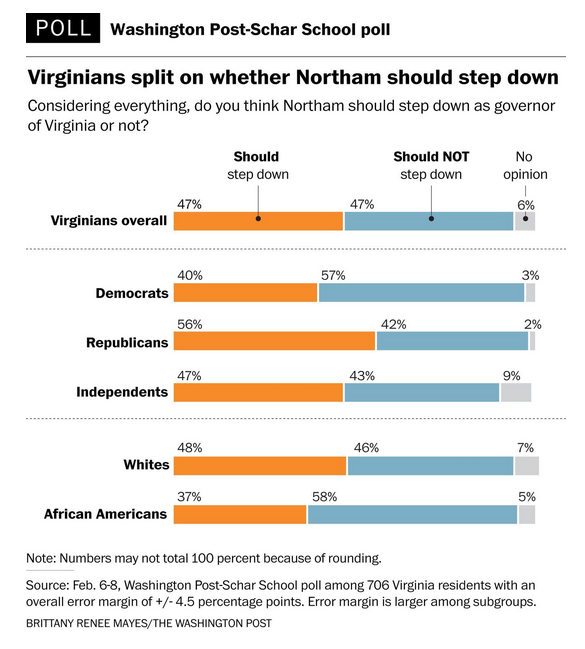 Which of the following groups of Virginians are more likely to think the Governor should step down: Whites or African-Americans? Check out more polling data here. What do you think explains those numbers? Ralph Northam, the governor of Virginia is a Democrat. How different do you think the poll results would have been had the governor been a Republican? Imagine you are Virginia’s Governor. Considering the electorate is evenly split: 47% to 47%, about your removal. Given there numbers, explain whether a governor who was a delegate or a trustee would be more likely to step down. How would you answer the poll question above? How different do you think answers to the poll would be if asked only of your generation? In this same poll, 11% of Virginians said either they or a friend had worn blackface. Given the fact that people routinely lie and under report embarrassing behavior to pollsters, and that 31% of the Virginia population is African American or minority (and unlikely to wear blackface). What does that tell you about Virginia? What would these numbers be like in your state? Explain whether you think that a White person wearing blackface is acceptable? Let’s say that you are a Democrat and you think wearing Blackface is not acceptable. At the same time, imagine that removing the Democratic governor will lead to a Republican taking over the Governor’s office. Considering this circumstance Explain what action you think should be taken. Explain whether you think political leaders should be fired for having worn blackface in public or in a public display (like a yearbook)? Does it matter if 30 years have passed since it happened? Why do you think Blacks are more forgiving than Whites about Blackface (see poll above)? Dozens of prominent leaders of the Democratic party have called for Governor Northam to step down. Why do you think that is? Listen to this NPR story about whether the Virginia Governor should resign. Journalists from the University of Virginia have started to look through back issues of its yearbook. They have found a disturbing amount of blackface and other racist imagery. Look through your school year-book and calculate the amount of blackface and other racist imagery. Share your reaction to the results of your research in class and online.